In a marked reversal of a five-year downward trend, students in the United Kingdom are reporting statistically significant improvements in perceptions of value for money from their higher education experience. This is the headline finding from the 2018 Student Academic Experience Survey (SAES) published today by Advance HE and the Higher Education Policy Institute (HEPI). More than 14,000 students took part in the SAES, an annual survey that began in 2006 and has been recording the views of students about their academic experience and their attitudes towards policy issues that impact upon them. The SAES offers insights and commentary and is widely quoted and used to inform policy and practice in higher education in the UK. 38% of students in the UK perceive ‘good or very good’ value from their course. This is a three percentage point improvement over last year’s survey and reverses a five-year downward trend. Fewer students studying in the UK, 32%, perceive ‘poor’ or ‘very poor’ value when compared with 34% in 2017. In particular, there is a clear, statistically significant, improvement among students from England, representing the largest number of students, where 35% report ‘good’ or ‘very good’ value. There has been an improvement (though not statistically significant) among students domiciled in Scotland, where 60% of students surveyed perceive ‘good’ or ‘very good’ value, while students from Wales and EU students studying in the UK report similar perceptions of value as last year, 48% and 47% respectively. Perceptions of value in Northern Ireland remain in decline – albeit not statistically significant. Students at institutions which secured a Gold award in the Teaching Excellence Framework are more likely to have received good value; but there is no noticeable difference on this measure between Silver and Bronze-rated institutions. 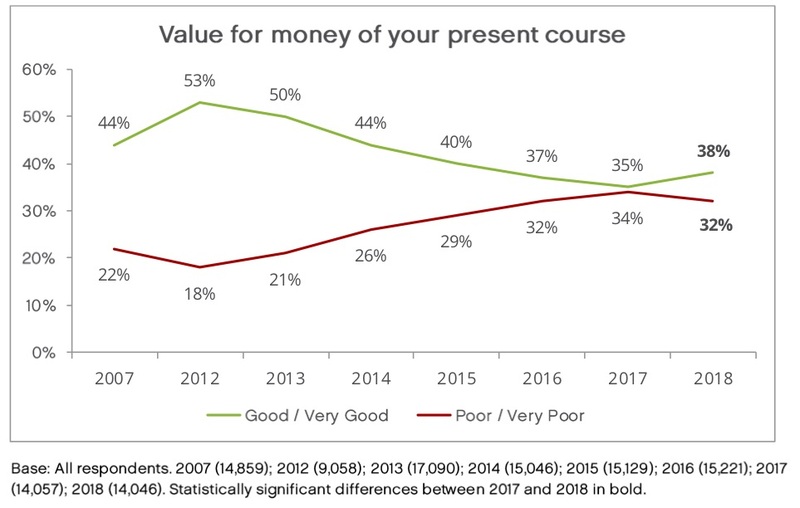 A new section in the 2018 SAES asks students to identify from a randomised list of factors what they predominantly have in mind when thinking about good or poor value: 68% of students who felt they received ‘good’ or ‘very good’ value for money regard teaching quality as the most important factor behind this, while 62% of those who perceive ‘poor’ or ‘very poor’ value pointed to tuition fees as the most important factor. For the first time, this year’s Survey asks students to reflect on the course choice they made: 65% are happy with their choice; and only 5% say they would not go into higher education given the choice again. Those students with a very light workload (1-9 hours) are least likely to be happy with their choice of course and institution, while 71% of those with workloads of 30-39 hours are happy with their choice of course and institution. The Survey also highlights the different experience of ethnic groups. While 65% of UK-domiciled white students report they are learning ‘a lot’ and 40% say they are receiving ‘good’ or ‘very good’ value for money, UK-domiciled Asian students report a poorer experience, with only 57% saying they are learning ‘a lot’ and just 23% perceiving ‘good’ or ‘very good’ value for money. There are lots of positive findings about the student experience in this joint report. Most students clearly feel they are gaining a great deal from their time in higher education. But, on some important issues, around one-third of students do not provide positive responses. For example, while two-thirds of students say they are learning a lot, are happy with their course and institution and are satisfied with their contact hours, one-third say they are getting ‘poor’ or ‘very poor’ value for money. As higher education expands to cover more people from previously under-represented groups, institutions have to work harder to ensure all students are catered for in full. On some important measures, black and minority ethnic students, commuter students, students in paid employment, LGBA+ students and students with light workloads give more negative answers. Our Survey exposes the areas where improvements are needed. But some of them – like improving students’ mental wellbeing – can only be fixed through concerted and collective effort that involves universities, Government and others. It’s very welcome to see that students’ perception of value for money is improving. The effort institutions and individuals are making in the pursuit of teaching excellence is paying dividends. This effort reflects strong leadership and hard work at every level in UK institutions – and Advance HE is committed to supporting that work in every way we can. It is worrying to see the disparity in the experience of different ethnic groups and I would support more work to get to the root causes of these issues. Despite this, it is very encouraging that just 5% of students would not go into UK higher education if they had to choose their path again, and this points to increasingly effective engagement of students as they transition into and through their undergraduate studies. The data tables in Excel are available here and the SPSS files are available on request. The Student Academic Experience Survey has been running since 2006 and shows how full-time undergraduates rate their time in higher education and their attitudes towards policy issues that impact upon them. The Survey has been designed and developed in partnership between HEPI and the Higher Education Academy (now part of Advance HE) and the fieldwork is undertaken independently by YouthSight.